Backed by a Lifetime Warranty and the Right Choice Promise™ you’ll have peace of mind when you invest in Hunter Douglas Window Treatments. Your Hunter Douglas product will be custom made for your specific needs and built to last. Hunter Douglas Designer roller and screen shades stand the test of time, increase the value of your home, and add unique style that works perfectly with your decor. If you’re in the market for new window treatments, designer roller and screen shades might be just the solution for your home. Speak with a trained consultant at Windo VanGo serving the Baltimore, MD area today. 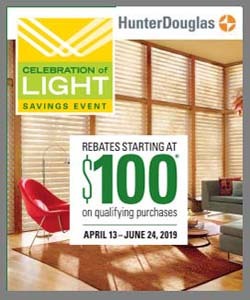 The Hunter Douglas Designer Roller and Designer Screen Shades have achieved GREENGUARD Gold Certification, meaning these products have demonstrated they have the safety factors to account for sensitive individuals such as children and the elderly. This certification ensures the products are safe enough to use in environments such as schools and healthcare facilities. The Designer Roller and Designer Screen Shades from Hunter Douglas are the perfect combinations of form and function. Available in a wide variety of colors and styles, these shades control glare, heat, and natural light. They also provide UV protection. These incredible shades also come with high-performance fabrics that go beyond the standard screen and roller shades that allows them to reduce glare, control natural light, and protect your furnishings from harmful UV rays. The LightRise® lift system is a top choice for enhanced child safety. This system allows you to operate the shade by simply lifting the bottom of the shade to raise it and pulling it down to lower. There are no cords! The UltraGlide® lift system has a single retractable cord that remains the same length whether you are raising or lowering your shades. This lifting system is perfect for child and pet safety. The Custom Clutch system has a continuous beaded cord loop. Simply pull the cord to raise and lower the shade. This is the standard lifting system for these shades. 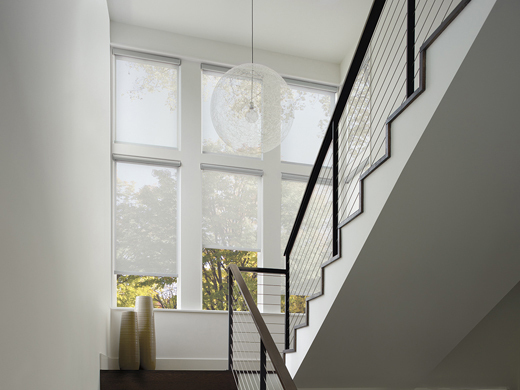 PowerView® Motorization is the ultimate in luxury and child and pet safety. PowerView features battery-powered wireless control that allows you to use a variety of control devices including our designer PowerView® Pebble® controller.